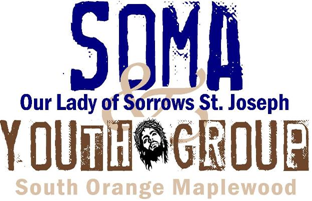 Our Lady of Sorrows and St. Joseph Parishes youth ministry is open to all high school students and is committed to the reality that young people are an important and integral part of our parish communities. The youth program seeks to foster maturation in faith of our youth of our parishes and surrounding community. Through a range of social, athletic, and spiritual activities, it engages in social justice issues through building a stronger relationship with Jesus Christ. We affirm the gifts of our youth through the Sacrament of Confirmation, and we foster opportunities for young people to share their gifts received by the Holy Spirit with the larger community. The spiritual and social needs of the youth are met with the committed leadership, guidance and support of our adults. The adults and youth of our parishes are therefore provided with the opportunity to grow together in Christian faith. Payment in full is required at time of registration in order to secure your child(ren)’s placement. If, however, you would like to set up an installment payment plan or would like to request financial assistance, please contact Colleen McDonald in the Religious Education Office at 973-763-5454 x285 or sorrowschurch@gmail.com before proceeding with your online registration in order to obtain a special financial assistance registration code. No child will be refused acceptance into our program due to financial hardship. I would like to make a tax-deductible donation to the Youth Group. Does your child have an Individualized Education Plan (IEP) in school? Please share any disability or learning support needs your child receives while at school. Please share all pertinent medical conditions or disabilities that your child has as well as any prescribed medications that your child takes that Religious Education Department staff should be aware of. Does your child require an Epi-Pen? In case of accident or serious illness, I request that Youth Group staff of Our Lady of Sorrows contact me using the authorization provided on this form. If the staff is unable to reach me, I hereby authorize the Youth Group staff of Our Lady of Sorrows to call the physician indicated and to follow his or her instructions. If it is impossible to reach this physician, the Youth Group staff of Our Lady of Sorrows may make any and all appropriate arrangements deemed necessary, including transporting my child to an emergency room by means of an ambulance. Members of the Youth Group Staff will make every effort, in the case of emergency, to contact parents first. Please identify two emergency contacts to be notified in the event a parent cannot be reached.